Following the country’s tourism growth, we list the total inbound visitors in the Philippines. From the table below, we can see that the inbound visitors continue to rise steadily. The implementation of new programs and introduction of new products targeting new and niche markets have revitalized the growth in this market. 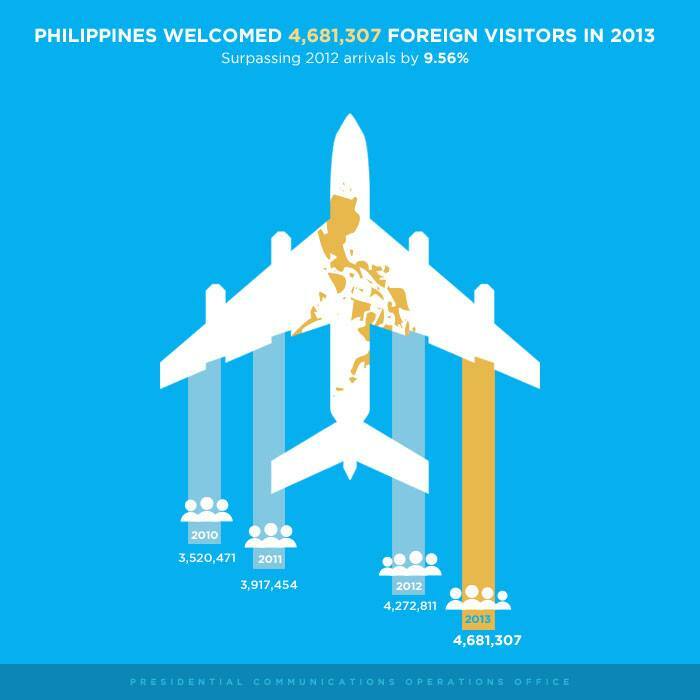 Philippines welcomed 4,681,307 visitors in 2013, an increase of 9.56% compared to the previous year’s record of 4,272,811. This feat gives the tourism industry a new milestone as tourists continue to demonstrate sustained growth amidst challenges. During the year, visitor count reached an all time high of more than 400,000 during the months of January, February, March, July, and December. The highest growth rate, on the other hand, were recorded in February (15.8%), June (14.0%), and August (13.0%). South Koreans remain the biggest source market with 24.9% share to total inbound visitors at 1,165,789 million arrivals.